← Ficus carica…..or figs to you and me! The more alert among you may have noticed that we are approximately two-thirds of the way through March. However, I have two excuses. The first is that the Central belt of Scotland is at least a fortnight behind the south of England when it comes to all matters of the garden variety and the second is…..IT IS STILL SNOWING!!!!!! The snowdrops have now “dropped” and the daffodils, tulips, crocus and hellebores are thinking WTF? I did manage to tidy my brassicas and start planting some seeds but other than wandering aimlessly around the garden, wrapped up like the Michelin man and leaning at a jaunty angle into the wind….not much has been happening. Spread compost thinly over soil as a mulch to give it a kick start. We actually managed to do this, the reason being Mr Mac needed to turn the compost and we had to get rid of the stuff that was ready to use. Needless to say, Mr Mac still has not turned the rest! Sow fast salad leaves. I have also managed to do this in a pot in the greenhouse, although the seeds took 10 days to germinate rather than the two or three days in the summer. Deadhead pansies and primroses. I have a 100% failure rate on this. The pesky sheep that got into the garden ate all the pansies and the primroses I bought as plugs last summer have yet to flower! Start to sow hardy annuals outdoors.…no chance. Move summer flowering shrubs that are in the wrong place and lift and divide border perennials. We would but we can’t find them yet! Start warming the soil for vegetables by covering with a cloche or polythene. Start chitting seed potatoes. Almost. We have been to the garden centre and bought seed potatoes but they are still in the garage. Rake up leaves, spike the lawn, clean troughs and containers, clean greenhouse glass to maximise sunlight, sharpen tools, stock up on compost and tidy, tidy, tidy and weed, weed, weed. 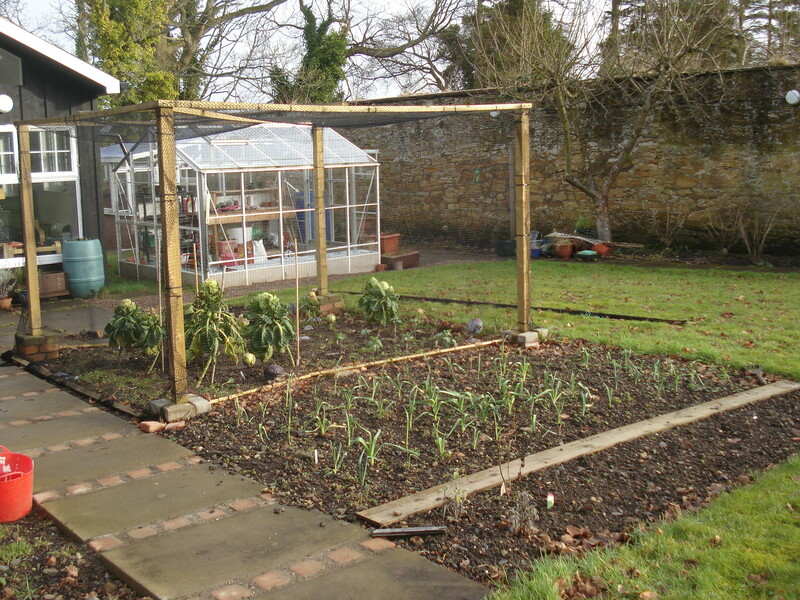 Plant onions, shallots, summer cauliflowers and jerusalem artichokes and sow parsnips. Force rhubarb and prune gooseberries and blueberries. 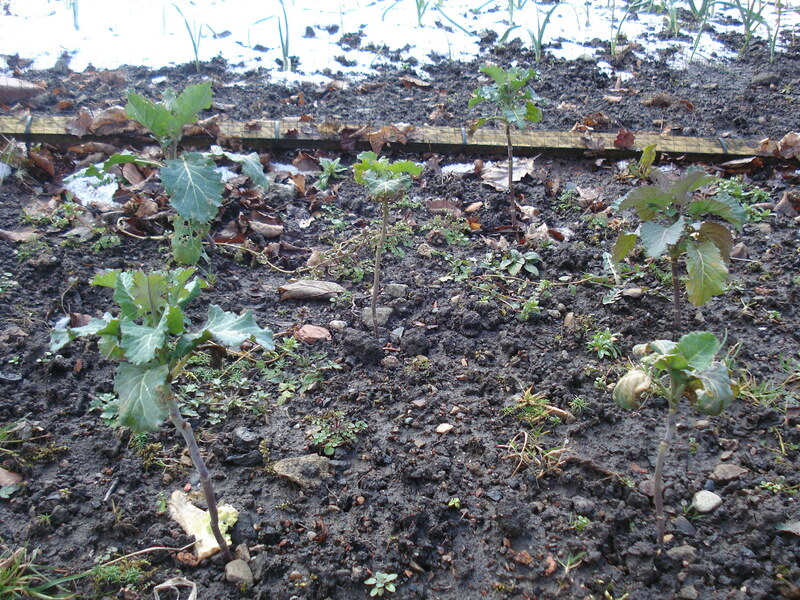 Last year for the first time I planted purple sprouting brocolli and I believe it should be ready about now. However, while they have started to grow, they are still only about 15-20cm high. I am not sure what to expect so if anyone can enlighten me it would be greatly appreciated. My leeks are doing well. They have taken a growth spurt in the last few weeks and should be on their way to the soup pot very soon! Today happens to be the Spring Equinox, the day when day and night are equal and from here on we will be bathed in sunlight. I can’t help but be an optimist and sense that all this late snow means we are in for a long, hot summer…..bring it on! This entry was posted in General, Hints and tips and tagged border perennials, chitting potatoes, compost, flowering shrubs, gardening, hardy annuals, jobs for March, leeks, nature, pansies, plants, primroses, purple sprouting broccoli, salad leaves. Bookmark the permalink. Well, it’s not snowing here, but the ground is frozen solid. But if you have to lean into a frigid wind, you may as well do it at a jaunty angle.